If you're looking for a chic fashion accessory, these sophisticated sunglasses frames for women will perfect your final look. 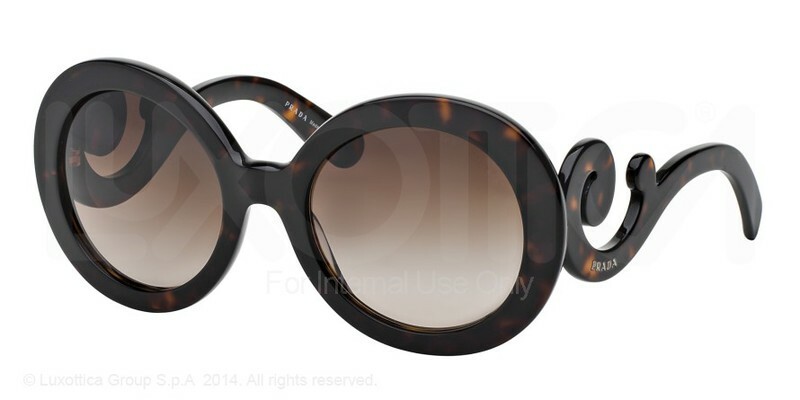 These plastic Prada PR 27NS MINIMAL BAROQUE sunglasses are perfect if you live an active life. They're lightweight, smart looking, and made out of a blend of high-quality plastics. If you have a higher nose bridge, you might find a pair of sunglasses with nose pads might be a comfortable option for you. Fully rimmed sunglasses' Prada PR 27NS MINIMAL BAROQUE frames are perfect if you want to make a statement with your eyewear while fully protecting your lenses. Round frames add more of a youthful charm to your already established look, which is perfect for you if you're grown-up who likes to have fun amongst all the work. Never mind the serious stuff, have a good time instead, because life is all about living and that's what these round sunglasses allow you to do. Ideal if you've got more angular features, the roundness will help take off the edge. Walk like a catwalk model down the busy streets of Manhattan or Paris wearing your designer eyewear frames. Made from the finest materials and designed with love and ingenuity, you'll have everyone whispering as you walk by in style. If you're trying to detract from some of your more obvious features, a pair of Prada PR 27NS MINIMAL BAROQUE frames with low temples could be the perfect answer. awesome!! I like it so much!! These are gorgeous sunglasses. I will be ordering another pair for my sister! I had ordered brown sunglasses in the same kind of these ones and I loved them so much that I decided to order the black ones too. They are chic and elegant, the quality is awesome. I really love them.